Plancoin is a "boss key" program: it allows you to hide some selected windows in one keypress. It lets you set up two hot keys: one to hide the windows and show them back, and one to show the Plancoin Settings window. The program then runs in background and responds to the hot keys. To determine which windows must be hidden, you have to set up a list of sentences. 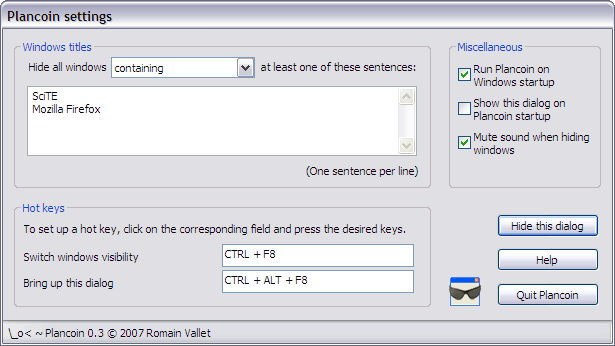 In the Include mode, every window whose title contains one of the sentences will be hidden. This mode is the default one. In the Exclude mode, every window whose title does not contain any of the sentences will be hidden. As Plancoin needs to run in the background all the time, it has been designed to use as few system resources as possible. Added an option to load Plancoin when Windows starts. Added an option to mute the sound when hiding windows. Fixed a bug that caused the desktop icons to disappear in some cases. If you forget the hotkey thats shows the dialog settings, you can now launch a second instance of Plancoin. This will show the Dialog settings from the first instance. Fixed a bug that prevented the settings from being saved. "There are many situations in life when you don't want people around you to know what exactly you are doing onto your computer. [...] you need a small and effective "boss key" application, which is capable of switching the look of your "working environment" with a single key press. That's exactly what Plancoin does." Plancoin was written in C++ using Microsoft Visual C++ 6.0. The installer was built with NSIS 2.23. Plancoin is part of the Wistinga Projects.